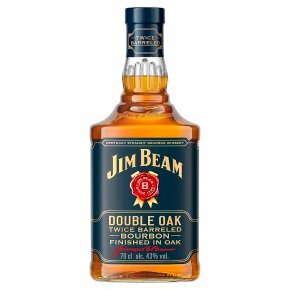 Like all of our bourbons, the new Jim Beam Double Oak is crafted in charred oak. Its rich flavour comes from being aged a second time in another separate barrel. 43% Vol. This expertly crafted expression is first matured in new charred American white oak barrels - as with all Jim Beam Kentucky Straight Bourbon - before being transferred into a second freshly charred oak barrel for a further period of ageing. The twice-barreled production process allows the product to have greater contact with the wood, drawing out exceptional and perfectly balanced depths. Tasting Notes Golden amber in colour. Smells of rich caramel and vanilla with hints of toasted wood. Intense caramel and toffee flavours with a distinctive spiced oak taste.